Goldman Sachs is the most profitable and powerful investment bank in the world today. Fifty years ago, it was a marginal family firm with limited prospects. How did it ascend to leadership in Europe, Asia, North and South America; make many, many partners fabulous fortunes; and become the leader in IPOs, M&A, FX, bond dealing, stock brokerage, derivatives, hedge funds, private equity, and real estate?As a strategy consultant to Goldman Sachs for more than thirty years, Charles D. Ellis developed close relationships with many of the firm's past and present leaders around the world. 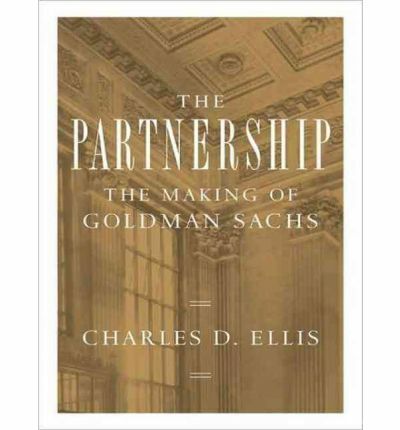 In The Partnership he probes deeply into the most important chapters in the firm's history, revealing the key events and decisions that tell the colorful, character-driven story of how Goldman Sachs became what it is today.Ellis tells the illuminating stories of the great personalities who sowed the seeds of Goldman Sachs's success: from Sidney Weinberg, a junior high school dropout with a flair for markets; to Gus Levy, who brought a ferocious intensity to every minute of every workday; to John Whitehead, who wrote the core values that defined a culture of teamwork in serving clients; to the unpretentious John Weinberg, who was the quintessential relationship banker of his era; to Robert Rubin and Hank Paulson, who both became secretary of the treasury; to Governor Jon Corzine; and finally to Lloyd Blankfein, current CEO and chairman of Goldman Sachs.Starting as a sole proprietorship dealing in commercial paper in the mid-nineteenth century, Goldman Sachs became an innovative underwriter, struggled to survive the crash and Depression, and came out of World War II to complete what was then the single most important transaction in Wall Street's history: Ford Motor Company's IPO. Goldman Sachs overcame a full set of dramatic perils: Penn Central's bankruptcy, Robert Maxwell's abusive frauds, and insider trading scandals. Ellis demonstrates how the firm's core values, intensive recruiting, entrepreneurial creativity, and disciplined risk taking-incorporating technology and hard work-laid the foundations, multiplied the firm's resources and profits, and magnified its power until it became today's Goldman Sachs: one of the most successful business organizations in the world.